There Are Many Ways to Donate to SJS. Click the box below to donate to the "Building Bigger Classrooms for our Smallest Students" campaign. 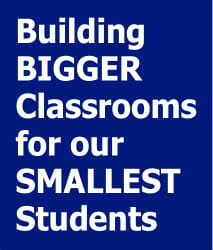 Please type in "Building Bigger Classrooms for our Smallest Students" in the comment section of the online form. The tuition charged does not cover the full cost of educating each child. Your gift to the Annual Fund helps to close this significant shortfall, and enables Saint James School to offer academic excellence and Catholic values merging in a small, caring environment.